This next item is an interesting one, from Swann the company that has a large lineup of surveillance devices. 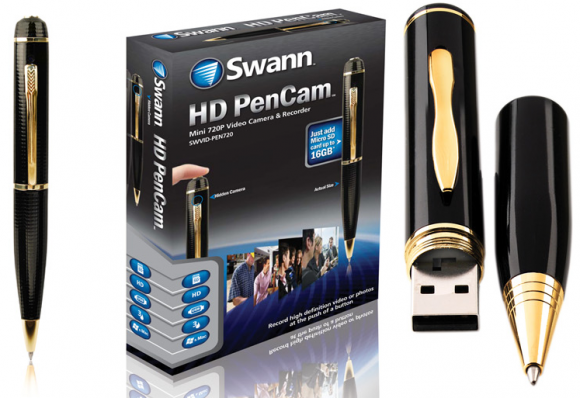 The item at hand is the Swann PenCam DVR mini video camera and recorder, which allows you to write, take high res jpg images, and film HD AVI videos via pinhole video camera. With 2GB of internal storage, it is also expandable to 16GB by addition of a micro USB card. The pen is rechargeable by USB and packs a ninety minute battery life to easily catch those unexpected office or life moments to upload for all to see. The Swann PenCam is available now for the price of 99 dollars.